Amazon Echo: is it the smart home Trojan Horse? Could Amazon’s Echo be the Trojan Horse that gets the smart home and IoT inside our homes — and consciousness? Fast forward to this holiday, and I suspect Amazon’s Echo will have a similar impact for the IoT and, in particular, smart homes (aided, no doubt, by the redoubtable Oprah, who gave it her imprimatur as one of her Favorite Things — which now, conveniently, has its own page on Amazon — for this year!). In case you’ve been hibernating for the past few months, during which time the Echo has taken off, it’s the slim (9.25″ x 3.27″) cylinder that sits on your counter, and, after starting out largely to access Amazon’s streaming music service by voice, seems to take on new functions every week. For me, the critical step was when Echo was added to my fav IoT site, IFTTT, which makes the IoT’s benefits proliferate by allowing you and me to create “recipes” to trigger devices without requiring any programming skills. 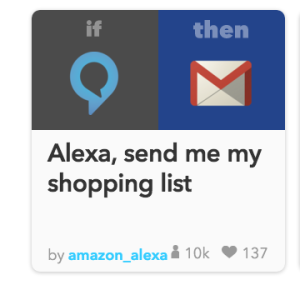 The number of new recipes allowing Alexa to “trigger” an action by a device, including Hue lights and the Nest thermostat, is constantly growing (you’ll notice that many of them relate to actions such as adding to shopping lists, a clever way of making it easier for users to shop at a certain online behemoth..). 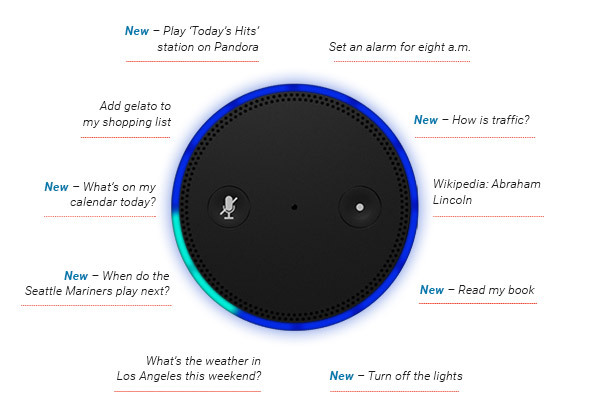 I’m also excited about Echo’s potential role as a hub for my “SmartAging” concept: granny starts out listening to Guy Lombardo’s “Managua Nicaragua” streaming on Amazon Prime, and the next thing you know, she’s saying “Alexa, turn down the thermostat 3 degrees.” What could be easier? Haven’t seen any Echo links to Quantified Self devices yet, but I suspect that’s only a matter of time, and others are now enthused about its benefits to the disabled. PS: You can track new developments with Echo on its Twitter feed, as well as one from Dave Isbitski, the Echo’s chief evangelist.